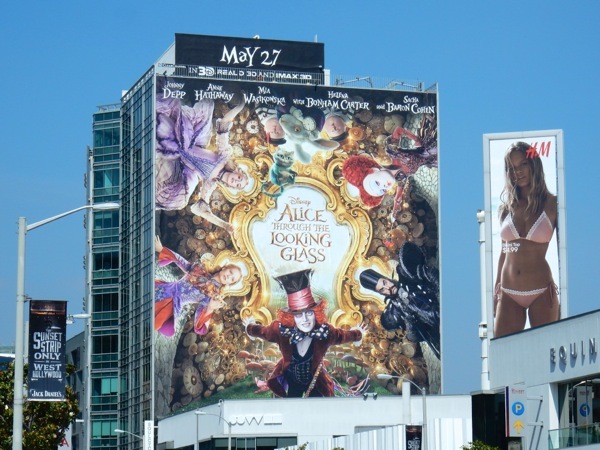 Under the direction of Tim Burton, Disney's live-action version of Alice in Wonderland grossed over $1 billion at the box office globally in 2010. 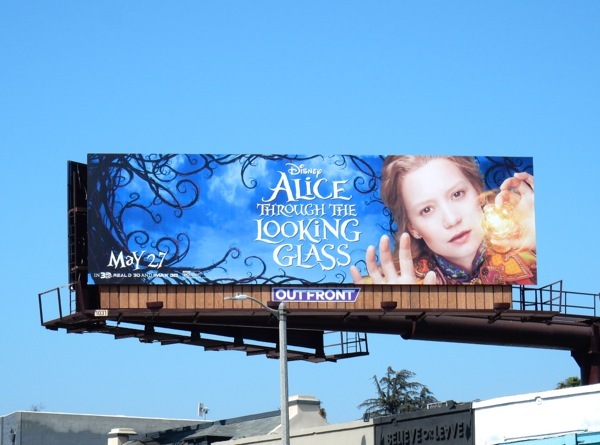 Now it's time for Mia Wasikowska's 'Alice' to venture once more down the rabbit hole, or more accurately Through the Looking Glass, for a brand new adventure directed by The Muppets James Bobin. 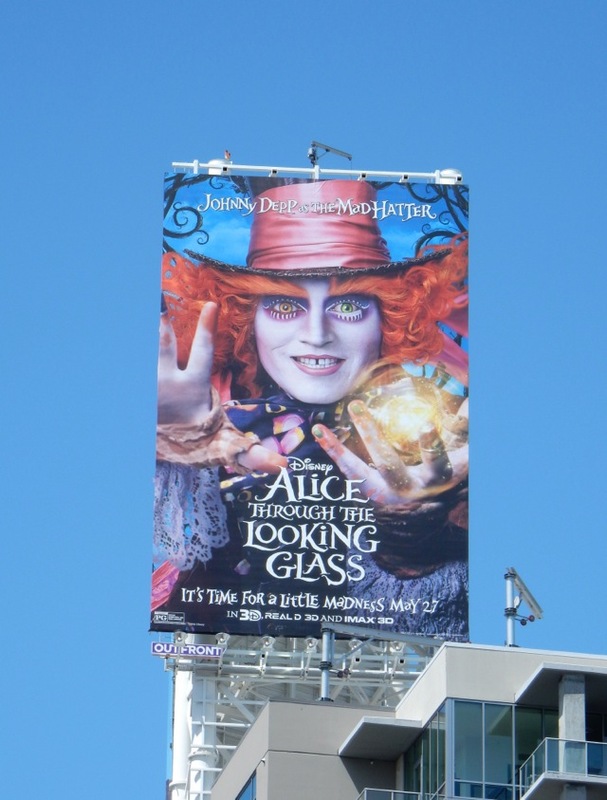 Fortunately the star power of Johnny Depp, Helena Bonham Carter and Anne Hathaway return as their Wonderland alter-egos, the 'Mad Hatter', the 'Red Queen' and the 'White Queen', to supply more than a dollop of mischief, madness and magic. 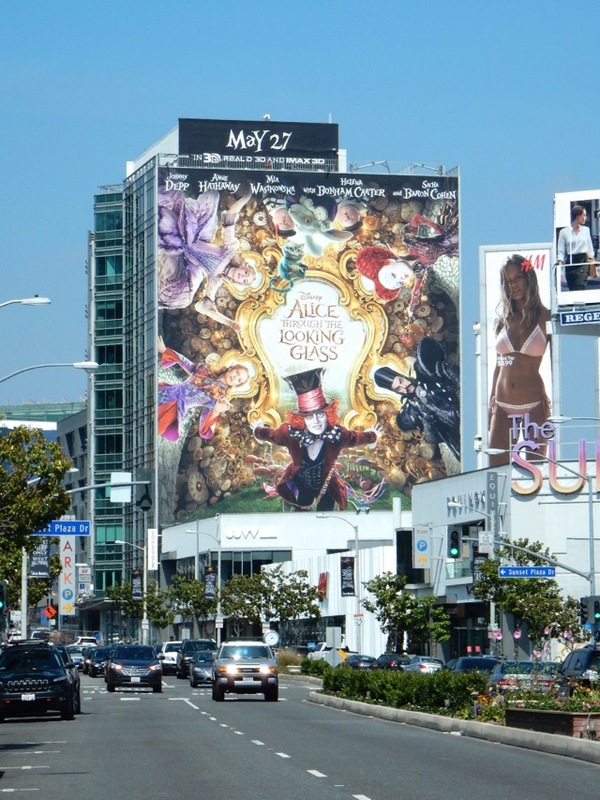 This time they're joined by Sacha Baron Cohen as the evil personification of 'Time' itself, as Alice must travel back to the past to save her friend the Mad Hatter and prevent Wonderland becoming a barren wasteland devoid of any life or magic. 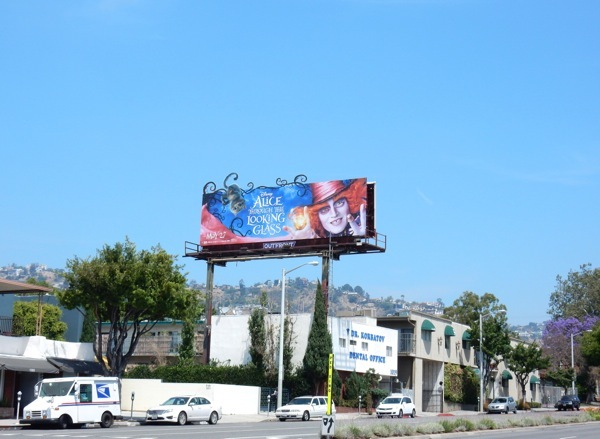 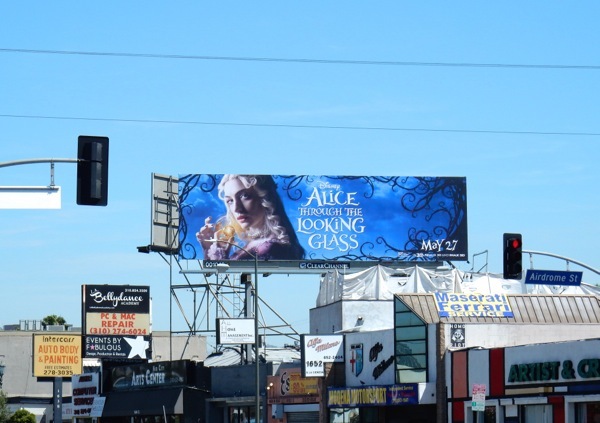 The 'White Queen' ad creative for Alice Through the Looking Glass was first spied along La Cienega Boulevard on April 18, whilst the 'Mad Hatter' billboards were spotted high above Vine Street on May 1 and along Westwood Boulevard on May 3, 2016, respectively. 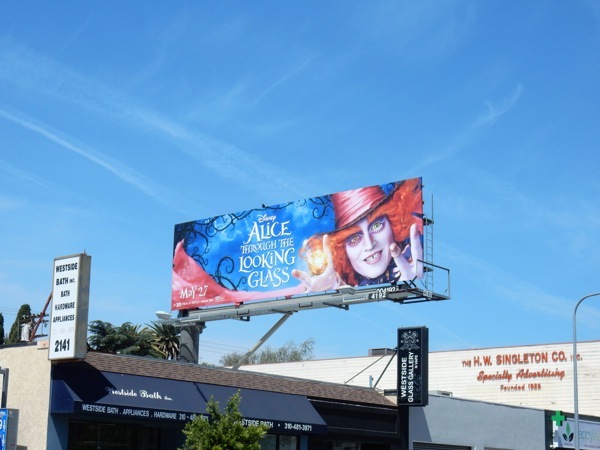 The 'Red Queen' was snapped looking dramatic above La Cienega Boulevard on May 8, whilst the 'Time' billboard was photographed the next day along La Brea Avenue. 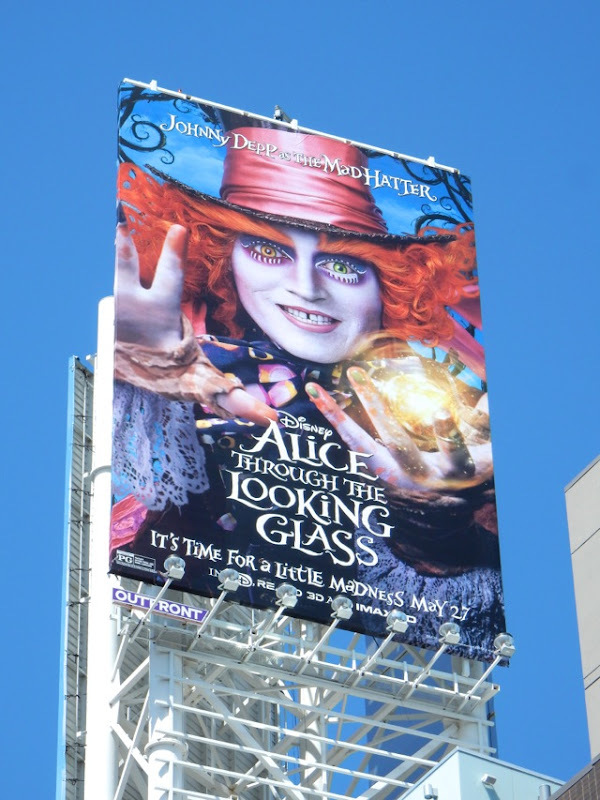 Meanwhile the giant-sized billboard was snapped towering over eastbound traffic along West Hollywood's busy Sunset Strip on May 10, 2016 (although it's a bit of a shame that Alice doesn't take center stage for her own film, with Johnny Depp's bankable Mad Hatter outshining her in the spotlight). 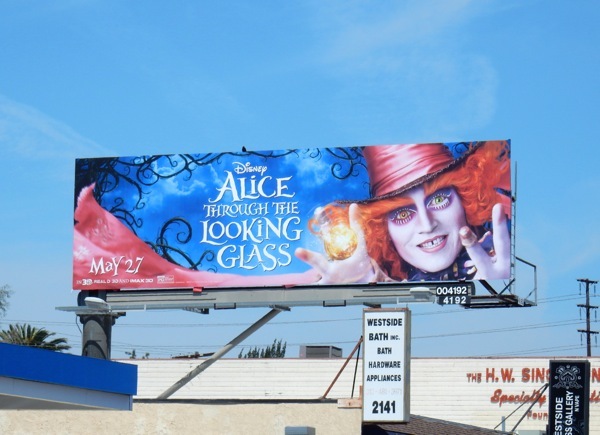 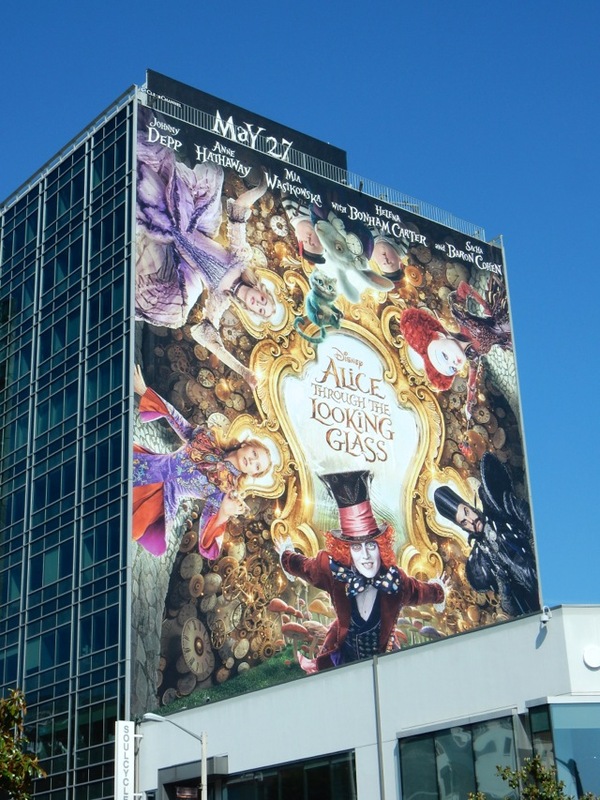 If you are a fan of Lewis Caroll's literary creations, you can also enjoy these fun Alice in Wonderland movie billboards from the skies of L.A. in early 2010. 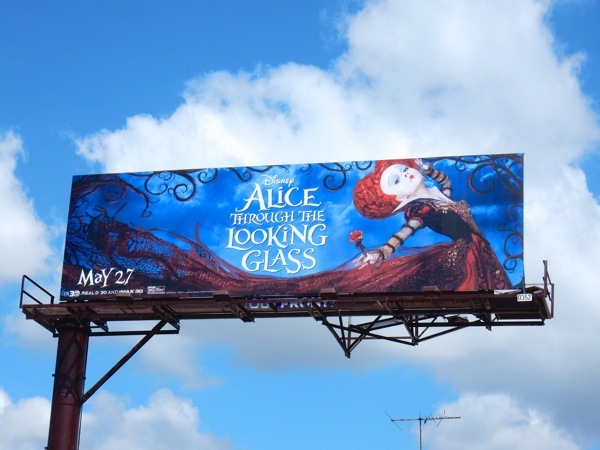 Meanwhile if you love the Disney movies, make sure you also check out these movie costumes from Alice Through the Looking Glass and these film costumes and props from 2010's Alice in Wonderland on display too. 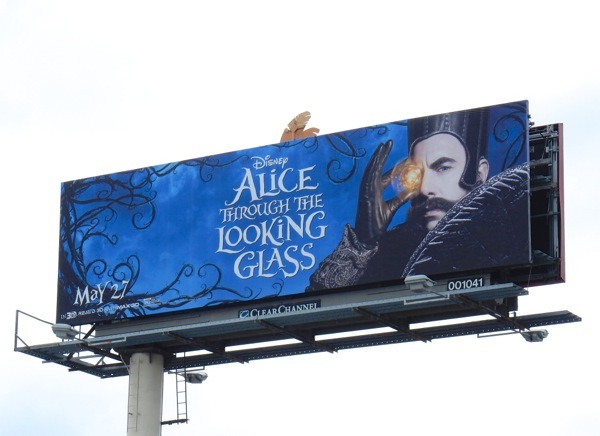 Tick-tock. 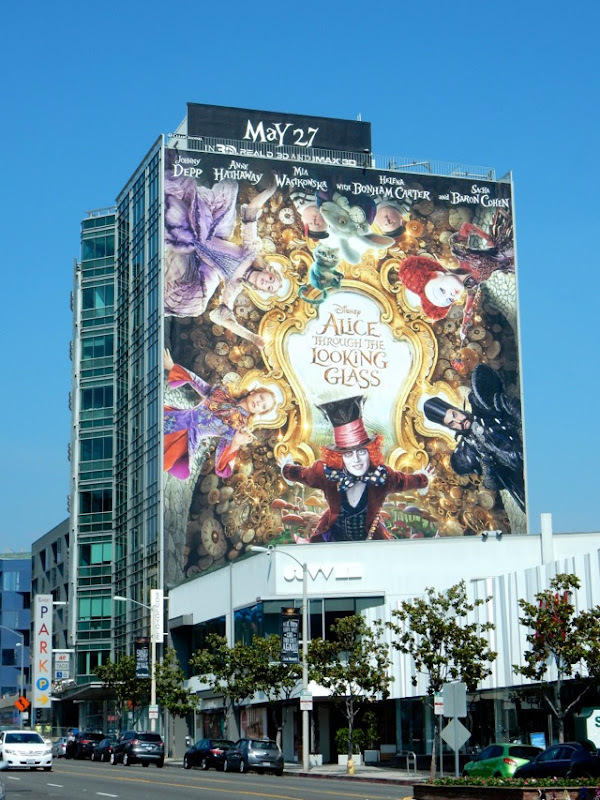 Let's see if our plucky heroine and her eccentric friends (and foes) can win audiences over on the big screen this time around. 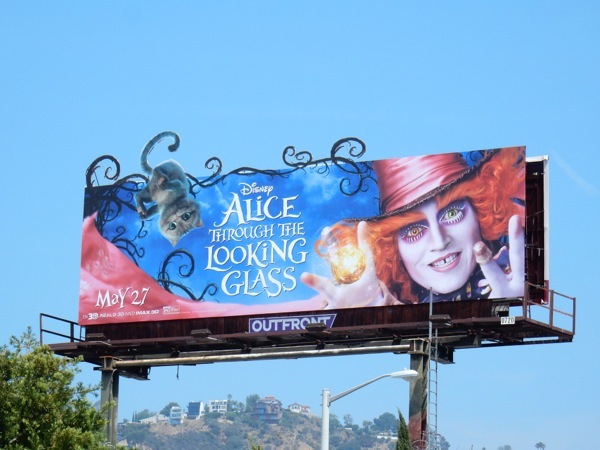 UPDATED: Here's another slightly surreal billboard for the movie sequel featuring the Mad Hatter and the floating 'Cheshire Cat'. 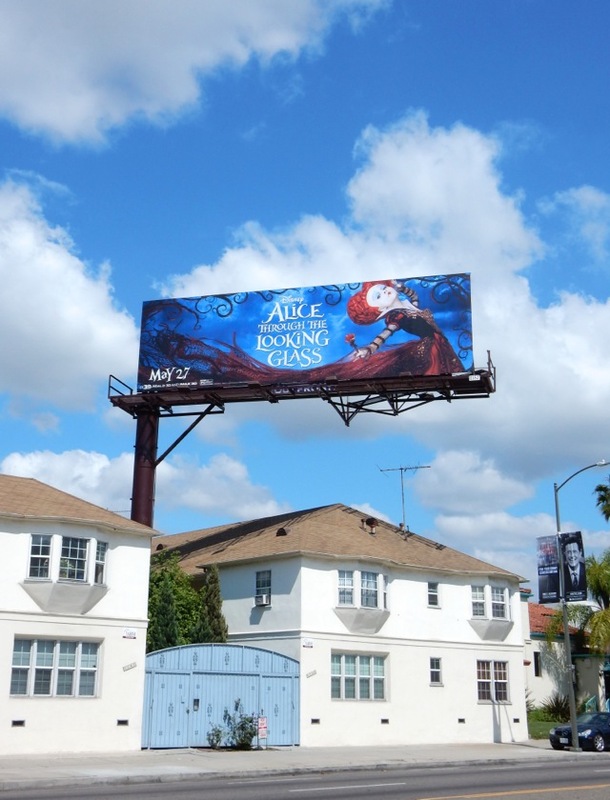 This special extension version making the most of those twisting vines was snapped along Fairfax Avenue on May 11, 2016. 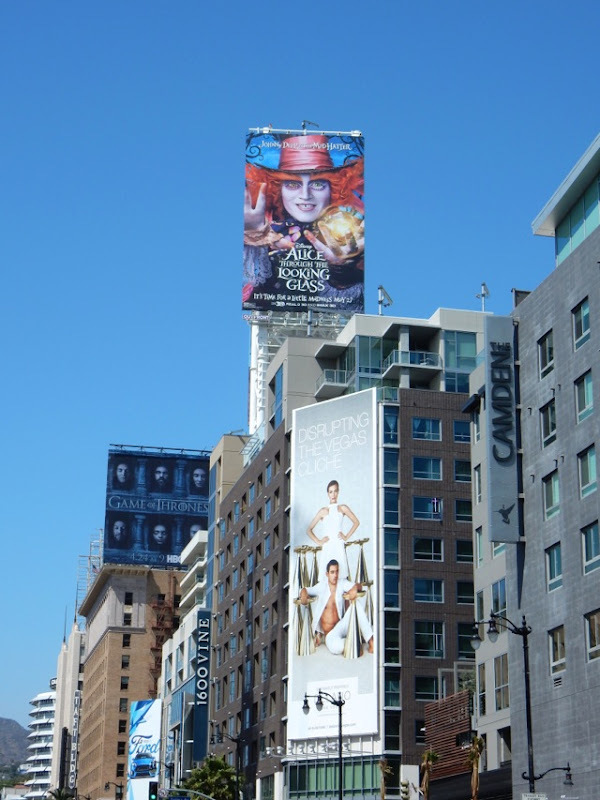 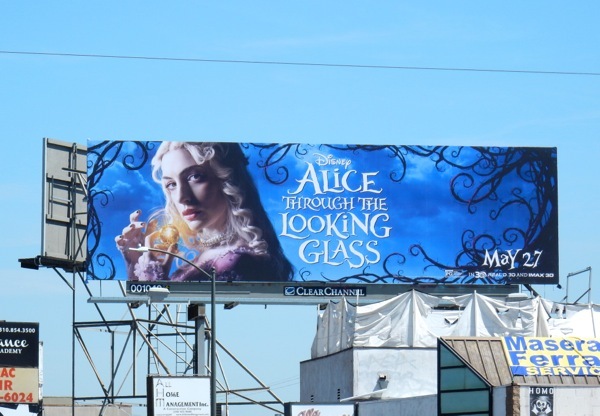 UPDATED: It's good to see that some billboards have now popped up with Mia Wasikowska as our titular heroine Alice, like this one spied above La Brea Avenue on May 26, 2016.